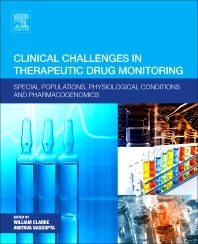 Clinical Challenges in Therapeutic Drug Monitoring: Special Populations, Physiological Conditions and Pharmacogenomics focuses on critical issues in therapeutic drug monitoring including special requirements of therapeutic drug monitoring important to special populations (infants and children, pregnant women, elderly patients, and obese patients). The book also covers issues of free drug monitoring and common interferences in using immunoassays for therapeutic drug monitoring. This book is essential reading for any clinician, fellow, or trainee who wants to gain greater insight into the process of therapeutic drug monitoring for individual dosage adjustment and avoiding drug toxicity for certain drugs within a narrow therapeutic window. The book is written specifically for busy clinicians, fellows, and trainees who order therapeutic drug monitoring and need to get more familiar with testing methodologies, issues of interferences, and interpretation of results in certain patient populations. William Clarke received his PhD in Analytical Chemistry from the University of Nebraska in Lincoln in 2000, followed by a post-doctoral fellowship in Clinical Chemistry at the Johns Hopkins School of Medicine, ending in 2002. In addition, he received an MBA focused on Medical Services Management from the Carey School of Business at Johns Hopkins in 2007. He is an Associate Professor in the Department of Pathology, as well as the director of both Point-of-Care Testing and Clinical Toxicology for The Johns Hopkins Hospital. Dr. Clarke is board certified in Clinical Chemistry by the American Board of Clinical Chemistry, and is a Fellow of the National Academy of Clinical Biochemistry. Dr. Clarke has published, as author or co-author, over 100 peer-reviewed manuscripts and book chapters. He is the Editor of the book Contemporary Practice in Clinical Chemistry, and the Co-Editor-in-Chief for the journal Practical Laboratory Medicine.